Terminal Cancer Diagnosis, What Now? A terminal cancer diagnosis is probably the worst kind of news you can receive. It is upsetting enough to be told that you have early-stage cancer that is treatable, but being told that you may only have two years or less to live, can be devastating. A person who receives a terminal cancer diagnosis goes through a number of different emotional stages. When your oncologist looks you in the eye and says the tests confirm that your cancer is terminal, any glimmer of hope that you had of beating the disease, disappears. Your heart sinks and you have an awful, empty feeling that may never go away. After the initial shock, your outlook on life is likely to change. People react in different ways. Some people draw strength through their religious beliefs. Some people become depressed and others are determined to live out the rest of their lives in as meaningful and fulfilling a way as possible. Accepting the diagnosis and living with terminal cancer can be a little less painful if you have a strong support group of family, friends and other people who care about you. In addition to the decline in your physical health and emotional well-being, you may face serious challenges due to the financial burden of cancer. Even if you have health insurance that covers cancer treatment, your insurance is not very likely to cover all of your out-of-pocket costs. Insurance policies have deductibles and copays and you may be responsible for paying a large portion of the cost of some very expensive cancer drugs. Certain tests and experimental drugs that might be beneficial to you, may not be covered at all by insurance. Terminal cancer expenses can put a serious financial burden on patients and their families. 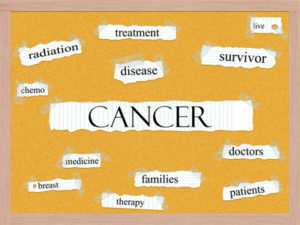 Any expense of cancer treatment that is not covered by insurance still needs to be paid. When you sign papers to have an MRI or radiation treatments, you are also assuming liability for any cost not covered by insurance. Sure, you may not be thinking about paying bills when you are about to undergo treatment, but eventually, those bills need to be paid. If you need money to pay doctors, radiologists, surgeons, hospital bills, home health services, or any other expenses, you may be able to get a lump sum of money from a life insurance policy that you own. If you own a life insurance policy and have terminal cancer, your life insurance policy may provide the best solution for coming up with the money to pay terminal cancer expenses. A life insurance policy is an asset that can be sold just like any other asset. Most people think that a life insurance policy does not have any value until the insured dies and the beneficiary can collect the death benefit. In fact, many life insurance policies have a substantial value above and beyond the accumulated cash value. Once you have your policy valued (an estimate of its present value based on a number of factors), a viatical settlement company may want to make you an offer on your policy. The amount offered will be higher than the surrender value but lower than the face value of the policy. Just as you should not make decisions about how to treat your cancer without consulting with both doctors and family members, you should not make any decision on a viatical settlement without consulting with a financial adviser and your family members. Viatical settlements can be a complex financial transaction and it is always good to have the agreement reviewed by your financial adviser or attorney. Dealing with a terminal cancer diagnosis is tough, but taking steps to reduce the financial burden of cancer can give you one less thing to worry about.